I don’t watch period, costume drama on the TV, even when they feature the wonderful Dame Judi Dench, so while I have heard of Cranford, a mini series set in the early 1840s in the fictional village of Cranford in Cheshire, I haven’t seen it. And writing the novella upon which is Cranford is based is pretty much all I know about creator Elizabeth Gaskell. That is about to change as Elizabeth Gaskell is the latest in our We Are The 51 campaign to celebrate the contribution of women. Elizabeth wrote novels and short stories which offer detailed portraits of the lives people led in Victorian society, from the the very poor to the very rich, and as such are of interest to social historians as well those reading simply for pleasure. Taking Cranford as an example, the women who are the stars of the book, with their gossip and snobberies, expose the undercurrents of Victorian society, particularly as it affected women. But while Elizabeth was a satirist of the period she was a gentle one, exposing her characters to laughter, but not ridicule. Elizabeth’s father was a Unitarian minister and she was her 40-year-old mother’s eighth child in 13 years. A year after Elizabeth was born her mother died and Elizabeth was sent away to Knutsford where she was raised mainly by an aunt. At this time Elizabeth’s future was uncertain, as she had no personal wealth and no firm home, and when her father remarried she spent several years without seeing him or his new family. Elizabeth was encouraged by her father to continue her studies and her aunts gave her the classics to read. Her brother John, who had a position in the Merchant Navy, sent her modern books and descriptions of his life at sea and his experiences abroad. She was soon pregnant again and this time gave birth to a healthy daughter. After the birth her career as a writer began as she started a diary of her new child’s life. Elizabeth bore two more daughters, a son who died before his birth was recorded, and then a son William, named for his father. 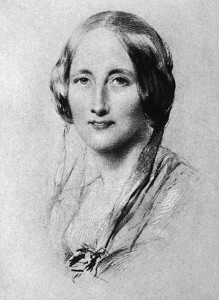 Elizabeth started to write more regularly for magazines and periodicals, including a cycle of poems, Sketches among the Poor, written with her husband and Visits to Remarkable Places containing the first work written and published solely under the name Mrs Gaskell. The novel was an immediate success, winning the praise of Charles Dickens, who invited her to contribute to his magazine, ‘Household Words’, where her next major work, ‘Cranford’, was first published. Elizabeth’s fame and popularity grew and she became an early “superwoman”, working at a prodigious rate and balancing motherhood with writing, travelling, socialising and charity work, visiting the poor and taking up cases of abused children. Elizabeth was just 55 when she died suddenly of a heart attack, her most ambitious book Wives and Daughters remaining unfinished. On 25 September 2010 a memorial to Elizabeth Gaskell was dedicated in Poets’ Corner in Westminster Abbey.